For digital nomads, finding a place to work with decent wifi (and coffee) can prove to be difficult in a new city. We spent a full month in the Peruvian capital and spent some quality time in the cafes sipping delicious coffee and yummy juices. As the third most populous city in the Americas, Lima is a sprawling metropolis split into 42 districts. 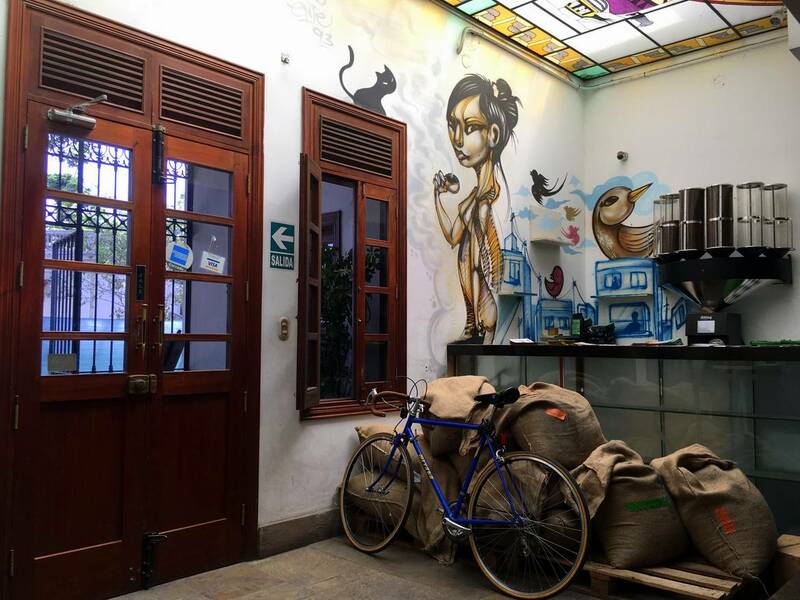 The cafes and coworking spaces in this post are located in Miraflores and Barranco. They’re neighbors so you could easily stay in one and hit up the cafes in the other. So without further adieu, here’s our list of best cafes and coworking spaces for digital nomads in Lima. Do you have a favorite cafe in Lima not listed here? Let me know in the comments! Miraflores is the main tourist district of Lima. Located 10 kilometers south of the city center, this is where you’ll find some of the best cafes & restaurants, green parks overlooking the Pacific ocean, and plenty of shopping. It’s an upscale area of the city with a more Western feel to it and it’s a great place for first-timers to the city. There are several cafes perfect for getting some work done dotting the area. Here are the best ones with all the information you’d like to know. Cafe 347 is a cozy little cafe is in a quiet area of Miraflores. It only has three tables inside and a few more outside. Each of the tables inside have their own power point. There are a couple of different coffees available as well as many different types of fresh-made juice. The lucuma is the best! They also have a few sandwich options and many different types of desserts. More of a restaurant than a cafe, Sofa Cafe is a very comfortable place to get work done. I would recommend going for happy hour and a quick bite later in the day. They have 2 for 1 Pisco sours (delicious) as well as plenty of delicious food options. If you do go earlier in the day, they got your back with multiple coffee options to help get you in the zone. I had the place to myself and was able to sit in a big, plush chair. Hello, productivity! Kulcafe has all kinds of delicious sounding food from appetizers to mains and dessert. You can choose from multiple seating options including an awesome sofa from the 70’s, tall chairs and tables, and even outdoor seating. The decorations give it a super chill vibe. It’s a great place to zoned in for a few hours as they had a killer playlist going when I was there; funky oldies from Al Green! Stick around for happy hour and Get 2 pisco sours for 24 PEN or a cerveza for 9 PEN. Arabica Espresso Bar is the place for coffee lovers as they have multiple types of slow coffee and a relaxing atmosphere to enjoy it in. Their wifi was also quite fast so you could be extra productive with your caffeine boost. It’s conveniently located in a hip part of Miraflores. They had by far the music selection was one of the best I heard at any establishment in Lima. We were jamming out to Queen, Talking Heads, and Lynyrd Skynyrd! Barranco is the more bohemian neighborhood where you’ll find a younger crowd of hippies living next to artists, musicians, and other creatives. There are plenty of colorful, colonial style neighborhoods to get lost in. Needless to say, it was our favorite place to hang out. The central square is surrounded by amazing restaurants, breweries, and of course, plenty of quaint little cafes. Here are the best. Tostaduria Bisetti was my favorite cafe in Barranco. It’s a really awesome cafe started by an Italian family years ago. They have lots of different styles of coffee at a very reasonable price. The seating options are plentiful with both indoor and outdoor options and there are plenty of power points. If you like sweets, the pie de chocolate blanco con maracuya (white chocolate passion fruit mousse pie) is to die for! Welcome to the cafe in a garden! At La Bodega Verde you can choose from an indoor or outdoor seat and enjoy a feeling of serenity in the middle of a busy neighborhood. The wifi is fast and it’s a great place to get some work done. They have a full menu so you could even spend the whole day if you needed to. I’m a sucker for lucuma so I tried their juice and it was fantastic. I highly recommend this little cafe if you’re staying in Barranco! Las Vecinas is a quaint little cafe that serves organic, artisanal food sourced from local farmers. There is a cool loft space with a sofa and a few other chairs as well as a couple of tables downstairs. The food sounds incredible and they have multiple drink options from coffee to local craft beer and wine. They were playing a Radiohead album when we were there. The only downside was a lack of power outlets. Otherwise, this is the perfect spot to get some work done while you grab a bite of healthy food. Comunal is by far the best coworking space in Lima. They have three locations in Miraflores (linked above), Barranco, and San Isidro with more locations opening up soon. The space in Miraflores is huge! They have big desks in a common area, meeting rooms, as well as private offices. In addition, they also have a massive kitchen with two fridges and four microwaves so you’ll never have to wait to heat up your lunch. There’s even a foosball table for those times where you need a break from the screen. Sometimes it can be hard to find a good workspace when you’re on the road. We’ve put in the legwork for you so you can figure out where you’re going and start ticking things off your to-do list. Whether you prefer an artsy cafe or a more corporate coworking space, you’ll find them both in Lima. We enjoyed the month we spent working there. The views from the cliffs overlooking the ocean are amazing and there’s always something going on in the city. It’s a great base for exploring the rest of Peru. Check out our ultimate guide to the Peru Hop bus to plan the rest of your visit to the home of the Incas! Thank you so much for reading, Aunt Janelle! That was my favorite cafe too! The lucuma juice was the best.